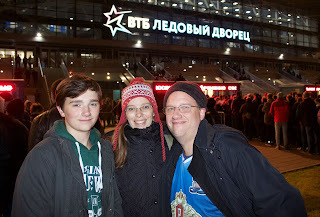 Our first night in Moscow, Donna the Amazing scored us tickets to a Dynamo game. Nothing is straightforward in Moscow, so we're indebted to her for trekking out to the brand new stadium to buy tickets in person, in a neighborhood she'd never been to before. The stadium is great, with all the trappings of an NHL building... hot dog stands, gear for sale, ice cream... She bought great seats, right over the home team tunnel. Dynamo was tromped by Locamotiv, it was a ton of fun. The stadium was warm, surprisingly so. The rink is roughly the same size as an NHL rink, but felt a lot smaller. There were no fights and far less physical contact, but still some blood due to a high stick. The fans were totally into the game, with bona fide cheering sections for both teams, complete with drums and chants and arm movements. 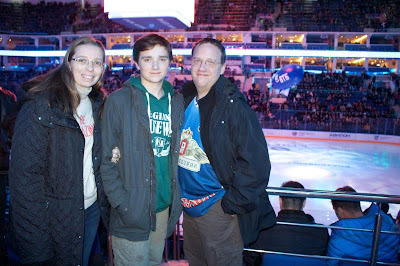 Yes, Ian was wearing his Ovechkin Dynamo sweater.